I am a big fan of shared world fiction. Some of my most favorite books are in fantasy settings such as the Forgotten Realms, Eberron, and Ravenloft. I found Paizo’s Pathfinder Tales through some of the author’s I have read in previous shared world settings. After reading Liar’s Blade I think Golarion is a place I could hang my hat for a while. Liar’s Blade introduces two reluctant heroes, Rodrick, a sharp tongued rogue, and his partner in crime, Hrym, who happens to be a sentient sword made of living ice. Rodrick is really not that good of a fighter, preferring to use his silver tongue and sharp wits to win the day. When it comes down to a fight Roderick would much rather rely on Hrym and his powers. One of the best things about the book was the banter between Rodrick and Hrym. It is cutting (no pun intended) and sarcastic even in the heat of battle. It reminded me of Robert Downey, Jr and Jude Law in the Sherlock Holmes movies. In fact, Robert Downey Jr’s Sherlock Holmes/Tony Stark was the first person that popped in my mind when I read Rodrick’s introduction. The duo also reminded me of Frizt Leiber’s Fafhrd and the Gray Mouser, which is high praise as they are the epitome of the swords and sorcery genre. On a deeper level the banter between Rodrick and Hrym revealed a true friendship. It was interesting to see this type of relationship between a man and a sentient sword. When I think of sentient swords I think of Michael Moorcock’s Stormbringer and his parasitic relationship with Elric of Melnibone. This was not the case with Rodrick and Hrym and added an interesting perspective to the story. I enjoy a good “quest” story. One in which there is treacherous terrain to traverse, deep caverns to explore, and ancient relics protected by formidable guardians. Add to the mix excellent supporting characters; a zealot priest seeking an legendary artifact, a deformed sorceress, and a destiny seeking half-elf, throw in a dash of treachery and deceit, and you have one hell of a fun read. 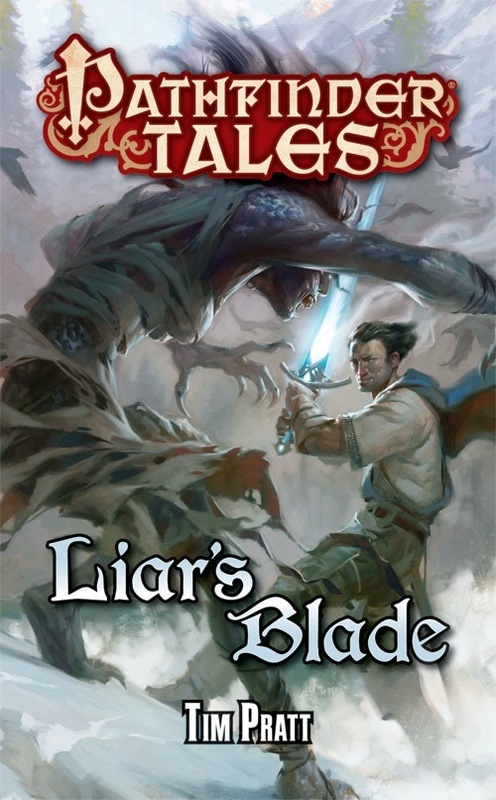 Liar’s Blade leaves you hoping (and anticipating) more of Rodrick and Hrym and I will certainly be adding more Tim Pratt and Pathfinder Tales to my collection. Posted in Book Review, Pathfinder Tales. Tagged book review, paizo, pathfinder tales, tim pratt.